OK, no, I can’t call AWP barbaric. But, ahem, one of the excellent books I picked up at the AWP bookfair is Andrés Barba’s Such Small Hands (translated by Lisa Dillman), the debut title from our friends at Transit Books. It was good fun to hear people responding to the book as if it were “timely”: in fact it is the story of a young girl with a dark imagination named Marina. There is no question that my favorite part of AWP each year is the bookfair, where my spirits are inevitably lifted by all of the passionate publishers, editors, writers, and readers—and so many terrific books! Among the great haul I brought home with me are titles from the ever-splendid Canarium Books and our mutually translation-obsessed pals at Open Letter Books. I snatched up two brilliant gems from Nouvella: Daniel Torday’s The Sensualist and Christian Kiefer’s One Day Soon Time Will Have No Place to Hide. Of course I couldn’t resist NYRB’s fabulous offerings; I had been eyeing Szilárd Borbély’s masterful Berlin-Hamlet, translated by Ottilie Mulzet, since before its release last fall. As a first-timer at AWP, I was mesmerized, overwhelmed, and pleasantly surprised. I spent entire days on my feet selling and buying books; sat in not the first overflow room but the second in order to hear the incredible Chimamanda Ngozi Adichie and Ta-Nehisi Coates read from their work; walked in the cold to the White House but could barely detect its dimming light through the obtrusive construction fences wrapping around its perimeter. I emerged from the conference with a heap of poetry books. I bought a collection of gems from the good folks at Action Books—I can now proudly boast my own copy of Kim Hyesoon’s Sorrowtoothpaste Mirrorcream, translated by the talented poet Don Mee Choi. Choi’s own collection, The Morning News Is Exciting, is now also among my possessions. 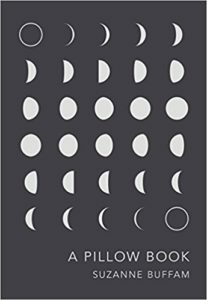 I couldn’t resist buying a copy of Suzanne Buffam’s collection A Pillow Book, published by House of Anansi Press. The title references the eleventh-century book by Japanese court lady and poet Sei Shōnagon, in which she famously collected her musings and amassed lists on countless subjects. Any work paying homage to Shōnagon is worth reading. My only non-poetry acquisition was Archipelago’s Autonauts of the Cosmoroute, a travelogue by the legendary Julio Cortázar and his wife Carol Dunlop, translated by Anne McLean. Adorned beautifully in a playful yellow, the book details the literary couple’s trip along the Paris-Marseilles freeway in their VW camper, supplemented by illustrations by Stéphane Hébert and photographs from the journey. Just as my mother taught me always to clean my plate of food, to try my best at things, and to do nothing by half measure, when I bring a haul home from AWP, it’s a healthy, grown-up haul. I brought home one broadside, twenty-two books, and five journals. They range from new titles, reissued titles, books in translation; they are all poetry, except one novel, written by a poet. They will keep me going, most likely, the remainder of this year, swimming through the pile, taking a break, and dipping back in again. One of my goals at the AWP bookfair is to buy only books I know I’d have trouble finding elsewhere. Because I’m a poet and reader of poetry, this applies to nearly all the small presses publishing poetry that have booths, tables, half tables, or quarter tables. To narrow it further, I look for titles I’ve been wanting for a while (Trafficke by Susan Tichy and Beast Feast by Cody-Rose Clevidence, both published by Ahsahta Press) and authors that are completely new to me (Melissa Buzzeo, whose fourth and latest title, The Devastation, published by Nightboat Books, is stunning). 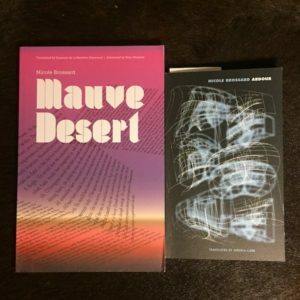 From my haul, what I’m most excited to read are two books by Nicole Brossard (whose poetry can be found in Two Lines 26 and in our Online Exclusives for Issue 26, both out tomorrow, March 14). Brossard is pretty new to me, but not at all new to her Canadian readership. 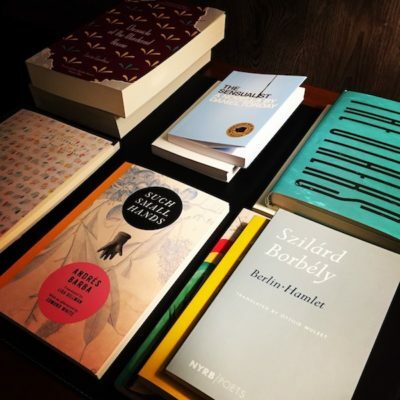 Her books Ardour, a collection of poetry translated by Angela Carr, and Mauve Desert, a novel translated by Susanne de Lotbinière-Harwood, both published by Coach House Books, are beautiful and intriguing. I’m already half way through Ardour and am entranced by its spare lyric and the use of silence in language in order to connect. Brossard is a poet you need to read. I’ll admit that I picked up Mauve Desert because of my personal fascination with the color mauve. It’s a feminist novel written in the late 1980s, and I’m looking forward to jumping in. I also discovered Plays Inverse. This press publishes plays as literature, rather than directions. I was drawn to The Invention of Monster/Plays for the Theatre by C. Dylan Bassett. Flipping through it, I saw short, crystalline poems, which, it turns out, are points of inspiration or invocation for performance. 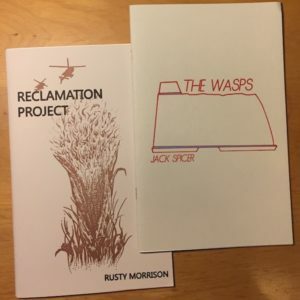 At an off-site Omnidawn Press reading on Thursday night, I picked up Reclamation Project by Rusty Morrison and The Wasps by Jack Spicer. Both are published by speCt! books, a small press based in Oakland. This was one of only two readings I managed to attend, but it was a lot of fun. The poets were great and I got the backstory of the Spicer piece. The Wasps is a short story from the early period of Spicer’s life when he thought he’d also write fiction and become a successful “sellout” like so many of the people around him. Luckily, he did not have enough patience to pursue monetary gain though writing. The Wasps, however, has been promised to be a great read. There are so many other awesome titles in my haul, but, as an editor on our biannual journal Two Lines, I want to give a shout out to the journals I found at AWP too. Newfound, Oversound, Fugue, and Brick publish a wide array of work, from poetry to creative nonfiction, to art, and are well worth attention. Now that I am back and the pile on my desk teeters, it’s time to start.